Patagonia is one of the ‘final frontiers’ on our planet: remote, untamed and much of it inaccessible except on horseback. Though travelled before and sporadically settled, it remains remarkably resistant to human trampling. Divided unequally between Argentina and Chile, Patagonia remains a land of mystery today. The history of those who settled in the nineteenth and twentieth centuries along its Andean frontier is even less known. They are the ‘dark horses’ of this book. Jon Burrough rode with his gaucho guide for 1,500 kilometres through this land of savage beauty. Dark Horses at the Patagonian Frontier evokes the rawness of the region using extracts from diaries, personal interviews, tales told or recorded, myths and legends—all wound round the narrative thread. Part travel record of a ‘third-ager’ on horseback (who was to discover he had cancer ten days out) and part history of this truly wild region, the book explores the landscapes and legacy of a pioneer culture. Illustrated with the author’s own photographs, it also contains several detailed route and location maps to ensure the reader does not get lost. 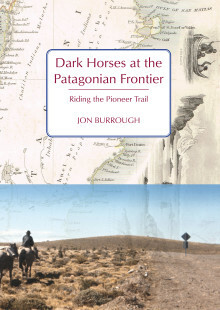 Dark Horses at the Patagonian Frontier is a tale both of the author’s epic journey and of the remarkable pioneers he met and who showed him a hospitality and friendliness which seemed to have no limit.